After coffee and donuts at the Aces Cafe, Saturday morning found us back at the Forums Plaza. I chose the Safe Single Pilot IFR presentation for this session. Now that I have started on my instrument rating, this is of special interest to me. I picked up some good tips from Doug Stewart’s talk. We spent the rest of the morning visiting vendor booths. In particular, I wanted to see the latest GPS units and Electronic Flight Bags that are available. A couple vendors really stuck out for me. The Anywhere Map SST has some very nice features especially when the optional UltraTaws high resolution terrain package is added. For a smaller unit, the Anywhere Map ATC surprised me with how easy to use it is and how readable the screen is. With the addition of Pocket Plates 3, it is a very usable IFR tool. Newly announced at the show was MaxNav for the ATC which adds high resolution sectional charts. The other handheld GPS manufacturer that impressed me was Bendix King. Their new Av8or Ace EFB looks like it can do everything I would need. The base map, approach plates, low and high enroute charts and taxi diagrams are all georeferenced so the aircraft position is displayed on the chart. In addition, this unit can interface with IFR certified panel units including the Bendix King KLN94 and the Garmin GPS 430/530. In that configuration, the Ace displays the course and waypoint information loaded into the panel mounted GPS. Both Anywhere Map units and the Av8or Ace support XM weather and Zaon traffic avoidance displayed on the screen. I suspect I could be happy with any of the three systems but, the Bendix King would probably be my first choice. We also visited the Bose and Lightspeed displays so that Georgia could try on some headsets. She liked the feel of the Lightspeed Zulu the best. Maybe a new headset is in her future? She has been using my original Flightcom 4DLX. We saw a lot more products, too many to include everything here, before going to Saturdays airshow. 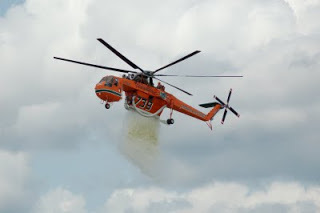 The days showcase included the parade of homebuilts and the Erickson S-64F Aircrane Helitanker “Elvis” doing water drops. 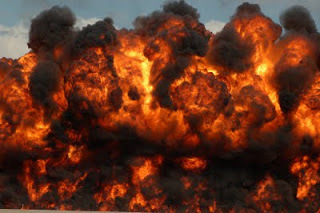 The Aircrane is an amazing fire fighting tool. Using twin snorkels, it can fill it’s 2,650 gallon tank in less than 45 seconds from any water source at least 18 inches deep and drop that water precisely where it is needed. The helicopter took off, flew toward Lake Winnebago and was back in just a few minutes. It flew down the runway dropping water over about a half mile of ground. At the end of the showcase, a camera helicopter flew along the flightline getting pictures of the crowd for upcoming films about AirVenture. We all got to be “extras” for a few minutes. The warbird extravaganza preceded the day’s show and included even more pyrotechnics than the day before. At the end, even though the wind was from behind us, we got a blast of heat from the 1000 foot wall of fire. You won’t see this many vintage fighters, reconnaissance airplanes, bombers and trainers in the air at the same time anywhere else. The days airshow featured: Liberty Parachute Team – Skydiving/Parachute, AeroShell Team – (4) T-6’s, Kirby Chambliss – Edge 540, Collaborators – 4 Ship, Mike Goulian – Extra, Greg Koontz – Decathlon, Misty Blues – Skydiving/Parachute, David Martin – Extra, Gene Soucy – Showcat Solo, Sean Tucker – Pitts. Again, this was a non-stop, action packed airshow. 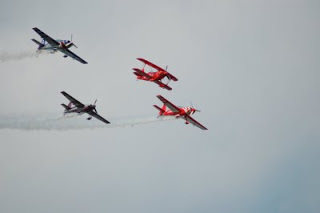 Every year, AirVenture attracts the very best airshow performers. They volunteer to come to Oshkosh because it represents a major achievement in their careers. These really are the best of the best. We spent Saturday night in Oshkosh and had dinner at Friar Tuck’s. We can recommend it to any AirVenture attendees. I like the prime rib sandwich while Georgia prefers the Reuben. Then, on Sunday morning we left to make the drive back home. The hotel is right off the end of runway 27 and, as we loaded the car, we watched the string of airplanes leaving for home too. 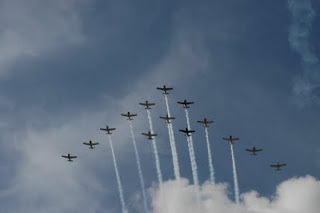 They came over in a constant stream with less than 30 seconds between them as they fanned out across the country – until next years AirVenture.